I suspect a few brooches will be among the 90th birthday presents collected by The Queen this year, but this one has a special personal touch. 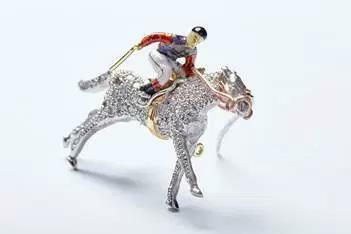 The one-of-a-kind brooch is an 18ct white gold and diamond-mounted galloping racehorse, ridden by an 18ct yellow gold enamelled jockey in Her Majesty's racing colours. Hand-made by prestigious Birmingham-based jewellery manufacturers Alabaster & Wilson Ltd, the 19th century-inspired design is taken from a 1975 portrait of Fred Archer, jockey to Prince Edward of Wales (later King Edward VII). Equestrian jewelry is one specialty of Alabaster & Wilson Ltd., who note on their website that "many pieces have been commissioned for presentation to members of Royal Families around the world." 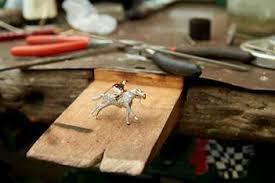 Their expertise certainly shows in the fine detail of this piece, which includes 35 diamonds, 0.52 carats in weight. Animal figures are not a category of brooch that The Queen wears very often. She does have other equestrian-related brooches, such as the as-yet-unworn Newhaven Horse Brooch and the FEI Lifetime Achievement Award Brooch. It's always surprised me, though, that she doesn't have a specific horse brooch that she wears to the races (The Princess Royal does, a gold horse brooch regularly seen). Perhaps a jockey in her very own racing colors is just what she needs.